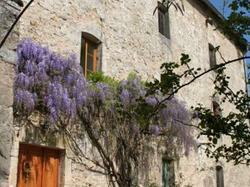 This guesthouse is located in the building of a former spice mill dating from the 19th century. Surrounded by parkland and gardens and offering guest rooms with exposed beams, it is situated in the village of Chargey-Lès-Gray in the heart of Franche-Comté region. Guest rooms have parquet floors and feature an electric kettle and modern en suite bathrooms with a bath or shower. Some of the rooms offer a view of the surrounding gardens. A continental breakfast is served each morning at the Chambres d'Hôte Le Moulin à Epices. In the evening, guests can also enjoy a meal shared with their hosts featuring products from the guesthouse?s garden and orchard. Relaxation facilities at Le Moulin à Epices include a library and a terrace. A children's playground is also available. An equestrian centre is located 8 km away in Autrey-lès-Gray and canoeing is available in Pesmes, 21 km from the guesthouse. Offering a view of the courtyard, this room is decorated in a South American style. It includes free internet access and tea and coffee making facilities. Offering a view of the park and the courtyard, this room is decorated in a Provencal style. It includes free internet access and tea and coffee making facilities. Offering a view of the courtyard, this room is decorated in a nautical style. It includes free internet access and tea and coffee making facilities. Offering a view of the park, this room is decorated with parquet flooring and exposed beams. It includes free internet access and tea and coffee making facilities.